I often get requests for vegan Passover recipes. And while I don't think I'll be able to "veganize" an entire Passover Seder menu anytime soon (I'm simply too un-experienced in Passover cuisine) - I can offer you a few treats and nibbles that I whipped up. First off is a delicious fruit and nut mixture called Charoset. And then three different peanut butter chocolate Matzo treats. 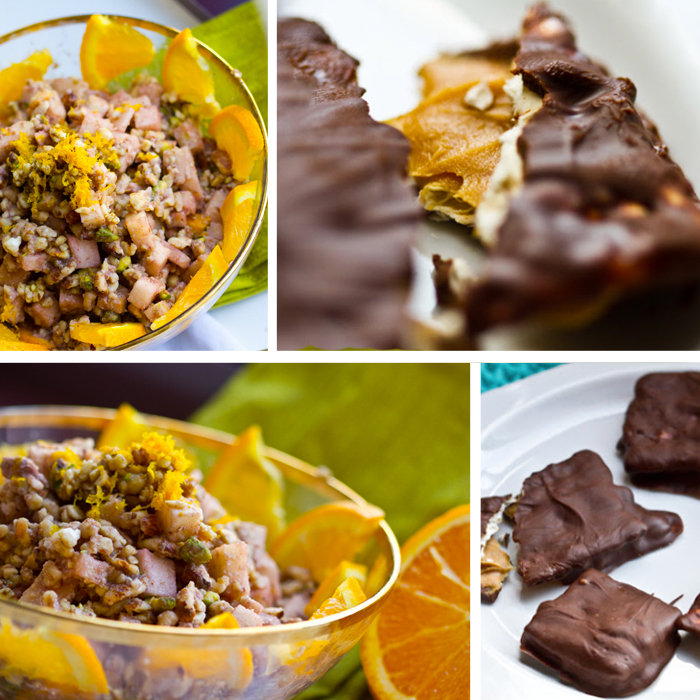 Passover delights made easy - and vegan!.. When I first started sifting through Passover menus online I realized that there is not a whole lot of room for vegan cuisine in the traditional recipes. However, the big fat loophole is that the number one staple of Passover - Matzo - is vegan! 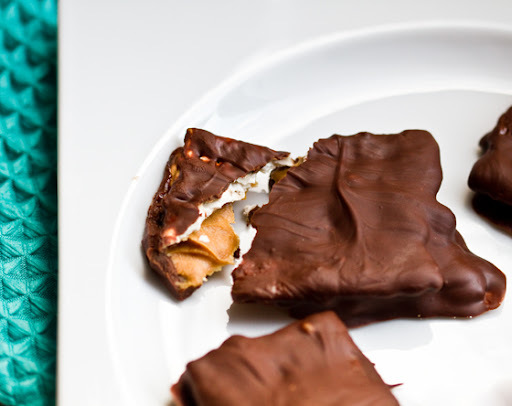 So you can certainly get creative with Matzo (as I did with my assortment of chocolate pb treats). ..and yes, you can totally veganize Matzo Ball Soup by using veg-based stock instead of chicken. And Kugel could be made vegan as well - add sweet potatoes for texture instead of eggs. Another totally vegan-approved recipe - that is indeed traditional - is called Charoset. It is a sticky fruit and nut mixture accented with cinnamon, red wine and more. I gave this recipe a whirl and loved it! Though I celebrate Easter, I love vegan Passover recipes and food! And I was thrilled to discover this traditional Passover recipe a few years ago. It is not only traditional and delicious - but also quite healthy! 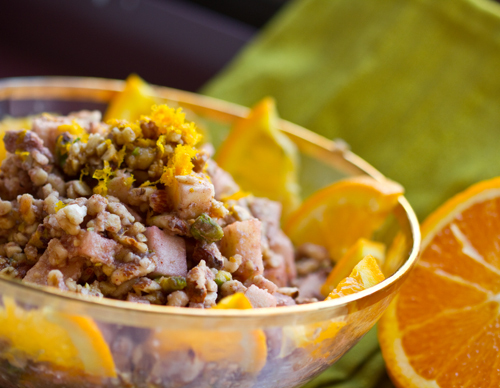 Charoset, is packed with fruit and nuts! I give my recipe a few unique accents. The traditional recipe also calls for a splash of red wine. Interesting, right? To be honest, I had no idea how this muesli or granola-like concoction would turn out. But once I blended the ingredients and took a taste, I was thrilled with the results. Try it for yourself!.. 1. Prep your nuts by pulverizing them in a high speed blender or food processor. The nuts should be very finely ground – a few chunkier bits are a nice touch. Peel and dice your apple and slice your orange. 2. Combine all the ingredients in a large mixing bowl and toss well. Plate in your serving bowl and grate orange zest over top. PART TWO - FUN WITH MATZO..
1. If you are making flat crisps leave the matzo as is. However, if you are making sandwiches you will want to carefully chop the Matzo into squares. It’s OK if the squares are not perfect – just try to break them into large shapes that match up in some way. If you have lots of leftover Matzo crumbles – you can make a few birds nests. 2. Heat a double broiler and add the chocolate, canola oil, salt and sugar to a stainless steel bowl or pan above the steaming double broiler. Melt the chocolate until creamy – do not burn! When chocolate is melted turn off stove an cover with lid to preserve melted state. Work quickly – as freshly melted chocolate is easiest to dip. 3. To make sandwiches: spread a small amount of peanut butter between two Matzo squares – enough to cover the surface. 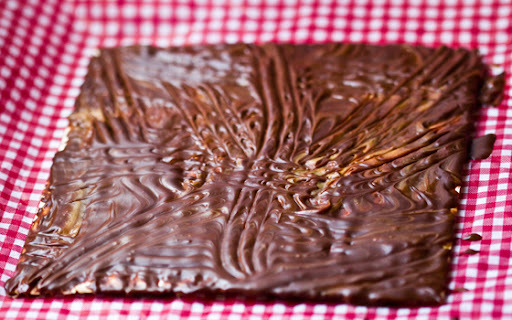 Then roll the squares in the chocolate – and place on a baking sheet with wax or parchment paper. Repeat until all your sandwiches are completed. 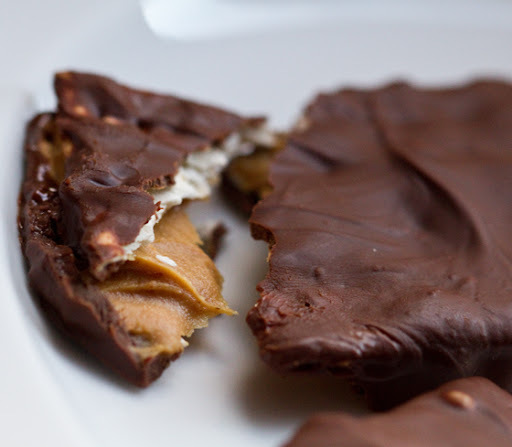 If you are making the flat crisps you will be able to swirl the peanut butter right into the chocolate and spread over top the top surface of each matzo square. Also place on the baking sheet. 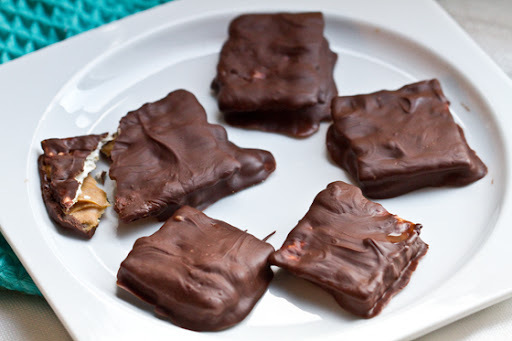 And lastly, if you are making all – or a few birds nest crisps, crush the Matzo squares and toss right into the peanut butter and chocolate mixture – also add in the slivered almonds. Scoop portions into cupcake liner or silicone baking cups – arrange on baking sheet. 4. For a quick chill – I place my baking sheet in the freezer. your treats should be ready to eat in just about ten minutes – the flat crisps take a tad longer. Yippee! Enjoy! These treats should be stored int he fridge or freezer until all gobbled up – I’m sure that won’t be too long! **note: Thanks to your comments, I now realize that peanut butter is not always Passover approved! - I guess make the matzo treats after Passover!